I'm currently reading Wicked Lovely by Melissa Marr. (Isn't that a fab cover?) I'm only 70 or so pages into it, but I adore it already. Luckily I have Ink Exchange waiting for me when I'm finished. Hopefully it won't be too long before I find a copy of Fragile Eternity. Now that I'm reading this series, my eyes have been opened to the amount of people discussing this series of books on blogs that I read. How did I miss them before? This week has been trying for me - I try to stay away from a series of books if I don't think I'll be able to finish the series in a short period of time. I'm so impatient to know how things turn out! But I couldn't resist this series and it came just after starting a different series of books - I've just finished City of Bones by Cassandra Clare. I might have to start buying books again so I'm not left hanging! But definately after Wicked Lovely, I will be turning away from the YA. I love you, YA, but I can only handle so much of you at one time. How about you? How do you balance out your adult book/children's book reading? What're you reading at the moment? Well done on joining the faerie takeover. Have you read Tithe yet too by Holly Black. 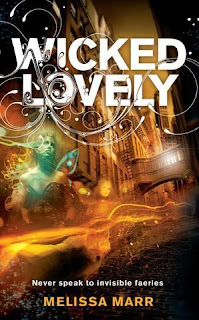 I have just bought Wicked Lovely, so really looking forward to reading it too. I loved City of Bones and I have City of Ashes waiting to be read. I read a lot of YA. I'd like to read more adult fiction and literature, but since I took on a library for girls, I'm obssessed with finding new reads for them. I'm always fantasizing that someone is going to ask me for something I need to know what to recommend. I like that cover much more than the one I've seen. charley - I love finding the differences in covers between countries, I find it fascinating. I wonder why that is. Susan - a library for girls? That sounds interesting. I always found that when I was a bookseller it was the young teenage boys who I most related to. Though I guess my conversion into all things faerie may change that.. Scrap girl - I've not read Tithe yet. I saw it once in the library so now I'm just waiting for it!